Earning the distinction of Certified Executive Chef through the American Culinary Federation (ACF), Disneyland Resort Chefs Chris Faulkner and Marcel St. Pierre recently joined Chefs Bill Orton and Chris Justesen, who also have been awarded this prestigious ranking that requires considerable education and work experience. The ACF is the nation’s largest organization of professional chefs and has been considered the authority on cooking in America since 1929. Faulkner is the chef at Storytellers Cafe at Disney’s Grand Californian Hotel & Spa, and graduated from the California Culinary Academy in San Francisco. His biggest inspiration in the kitchen? “Discovering new ingredients,” says Faulkner. Justesen is area chef at the Disneyland Resort and also graduated from the Culinary Institute of America in Hyde Park. His biggest culinary inspiration? “My two grandmothers,” says Justesen. 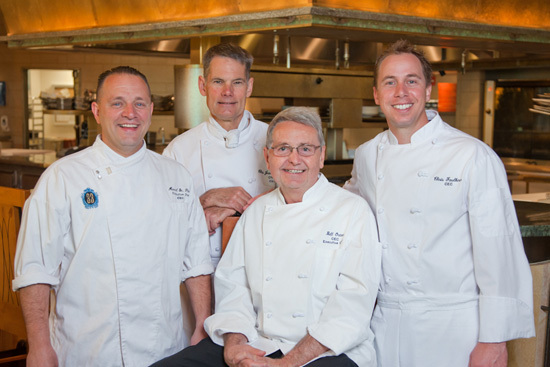 Orton heads Disney’s Culinary Academy and graduated at the top of his class from the French Culinary Institute in New York. Originally certified in February 2007, Orton is an advocate of continuing education, and says that his students are his biggest inspiration. “They get so excited about cooking, and their excitement is contagious,” says Orton.